"The best group in the country." - Scott Bauhs referring to the Mammoth Lakes Group coached by Terrence Mahon. This article gives you an idea how hard some Americans are working to be the best. Mammoth Lakes is definitely home to some of America's top runners in Ryan Hall, Deena Kastor and Anna Willard. Track Regionals... what's the Deal? Inside Look At Mammoth Track Club Running Times Many of our readers are interested in knowing more about the training of Ryan Hall, Jen Rhines, Deena Kastor, Anna Willard, Scotty Bauhs and the rest of Terrence Mahon's Mammoth Lakes group. This is the most informative article we've seen yet. 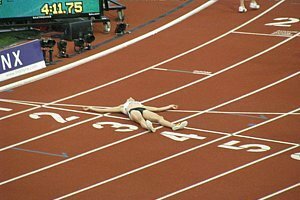 There is a reason American distance running is improving: coaches and athletes are working full-time to get better. 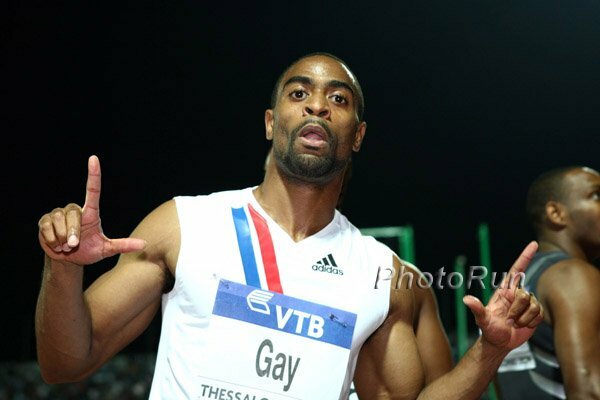 *IAAF Kawasaki Super Meet Recap - Gay Wins In 10.13 The Kawasaki Super Meet brought in a few stars including Tyson Gay, Felix Sanchez, Allyson Felix and Reese Hoffa. Times and performances were nothing to write home about but we're sure the Saki was goooood. 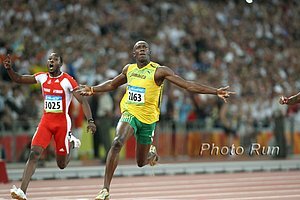 *Usain Bolt Camp Dismisses Mega $$ Offer Saying Bolt Is Still Puma Sounds like the offer is there but Camp Bolt needed to please the current sponsors. In case you missed it, Usain Bolt was reportedly offered a $100,000,000 long term endorsement contract by a crazy Chinese company. *Agent Ricky Simms Says Usain Bolt Is The Highest Paid Track & Field Athlete Of All-Time Even Before The Latest Offer Meanwhile most NFL punters make more per year than Bolt. 16 Siblings Complete Same Marathon In Under 5:30 It's rare enough having 16 siblings these days, let alone all 16 of them running the same marathon!! 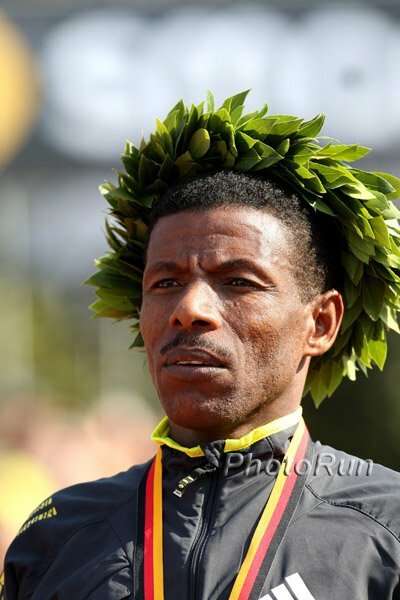 Jim Hage Asks "Is Haile Still Great?" After He Won His 4th Straight Berlin Marathon In 2:06:08 After going out in 1:01:44 and breaking the world 30k world record en route to the 26th fastest marathon of all-time (of which he has run a whopping 6), Employee #1 is shaking his head at the question in disbelief. Dathan Ritzenhein And Amy Yoder Begley Lead Recently Announced Team USA Half Marathoners Buzz: US fans will be really interested to see how Ritz does in this race. 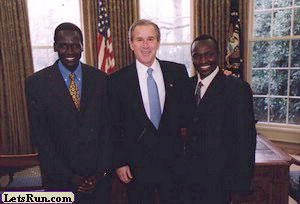 After Berlin 10k Snub, Japan-Based Kenyan Gideon Ngatuny Turns Down Athletics Kenya The paper tries to make it seem like Ngatuny snubbed Athletics Kenya after they invited him to run the world half marathon but really his sponsors won't let him run as the Chiba Ekiden is more important to them. LRC Special American High School Student Travels To Addis And Trains With The Ethiopians - Entry #1 - Kenenisa Bekele!?! A friend of LetsRun.com traveled this summer to Ethiopia. Determined to continue his preparation for the fall cross country season, Nebiyu Osman found a high-altitude training group in Addis Ababa that took him in. His stories, video, and 9-part journal entries offer the reader a chance to learn about the homeland of some of the world's greatest runners. Although we had not planned to share the stories beforehand, we found them so interesting that we wanted to release the entries 1-by-1 in a sort of mini-series. In this episode Neb finds his Ethiopian coach. 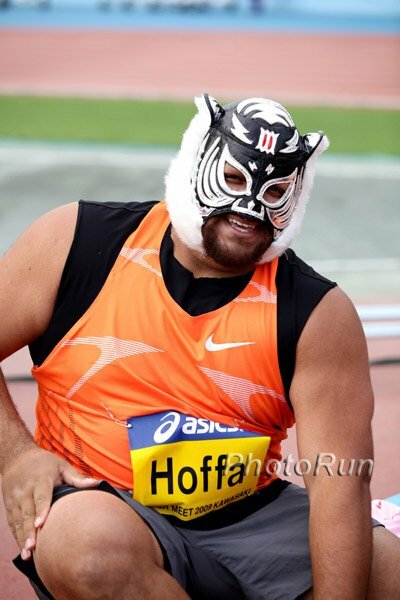 *Star-Studded Fields Announced For This Weekend's 5th Avenue Mile In NYC Sub-13:00 Americans Bernard Lagat and Matt Tegenkamp battle World Athletics Final medalist Leonel Manzano and many more studs on the men's side. The women's race can be billed as a USA vs. England battle with Hannah England and Lisa Dobriskey facing off with Christin Wurth-Thomas and Shannon Rowbury.